Daan Steenkamp Attorneys is a boutique conveyancing and advice practice. We employ only top class staff, enabling us to render superior service. We embraced a paperless, virtual style of practice, utilising only the best current software and have jettisoned traditional fixed address trappings such as offices. We will consult at a venue of our clients’ choice and, where necessary, rent space for formal meetings and the like. This has enabled us to keep overhead costs very low and pass savings on to our clientele in the form of discounts and reduced fees across the board. Focussing on specialist areas of practice results in efficient, knowledgeable interaction with clients at reduced prices. We pride ourselves on rendering useable practical advice. I am a practising conveyancer and notary public. I initially studied at the Rand Afrikaans University where I obtained a BA(law) and LLB degree. As a firm believer that practice and theory are complementary, I completed an LLM in estate law at Potchefstroom, followed by an LLD on training attorneys for the profession. This was followed by a postgraduate diploma in insolvency law at Pretoria and an LLM in commercial and company law at Unisa. I prosecuted and worked as a legal advisor for the State before qualifying as attorney. I entered practice as a litigant in Pietermaritzburg, discovered the error of my ways and moved on into conveyancing and later as estate law specialist. I currently practice as conveyancer and notary with specific interests in commercial, estate and trust law. I have, over forty years, served in positions from filing clerk to managing director of sizeable practices as litigant, estate specialist, property specialist and commercial practitioner. This has positioned me as an experienced attorney capable of handling any form of property work including developments, estate law problems and a wide range of commercial and notarial work. We have a particular interest in farm sales and form part of a consortium comprising ourselves, a surveyor, timber farm management specialists, a tax specialist and water and labour law specialists. This enables us to address all aspects of complicated farm transactions. We also provide a drawing service for other attorneys on either a flat rate or a fee-sharing arrangement. Our virtual set-up allows us to price our services very competitively; probably at around 60% of what a Durban practice would charge for the same service. Cervantes penned the novel on Don Quixote, a nobleman of la Mancha in 1605/15. The novel depicts a slightly off Quixote, flanked by the long-suffering Sancho Panza, setting out to revive chivalry. The term quixotic and phrase tilting at windmills, are derived from this light-hearted novel. Several writers and artists picked up on Cervantes’ theme over the years, amongst them Picasso and Jose Posada. 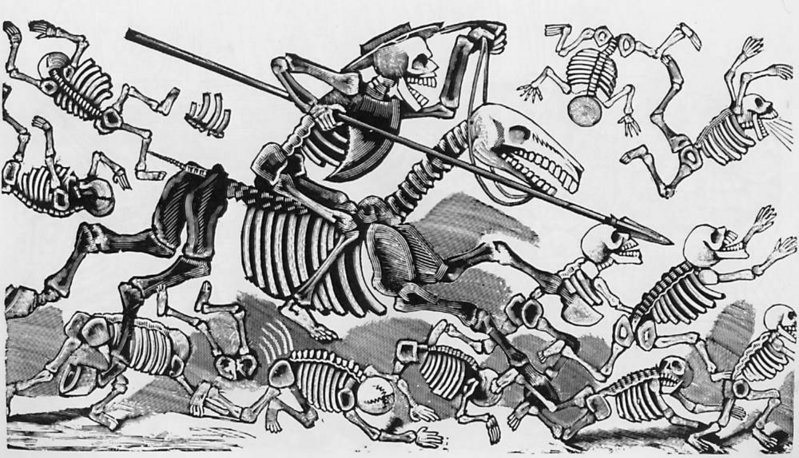 In 1910 Posada produced the etching of the skeletal Don Quixote depicted above. In this Quixote rides into battle, wearing an upside-down barber’s basin that he believes to be a legendary helmet of Mambrino; a solid-gold relic said to make its wearer invulnerable, and vanquishes all. His Calavera of Don Quixote, represents “tongue in cheek” comment on personal crusades undertaken in self-belief. Perhaps Cervantes tells us not to take ourselves too seriously.